What's better than one cross? Three of course! 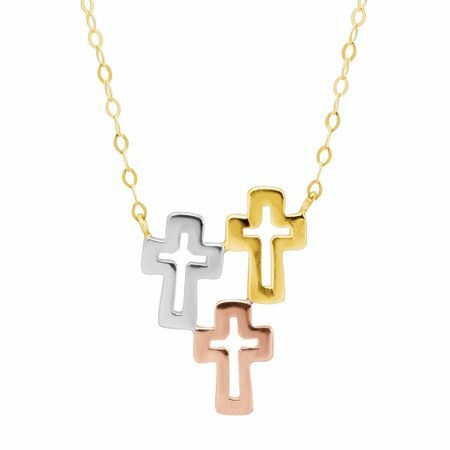 This down to earth take on the classic cross necklace is a perfect gift for a faithful person in our life. Or the perfect gift for yourself, wear it every day as a reminder of your beliefs and unbelievable fashion sense. Necklace piece created in 14K yellow gold with a tri-colored feature piece that measures 3/4 by 9/16 inches. Comes with an 18-inch cable chain and spring ring clasp.